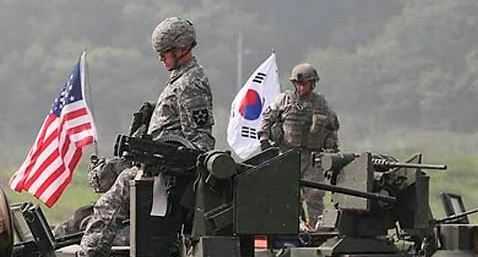 North Korea's official newspaper urged South Korea on Monday to stop joint military drills with the United States, saying it will help create a peaceful atmosphere and move forward inter-Korean relations. The Rodong Sinmun, an organ of the North's ruling party, also called on Seoul to stop bringing any foreign strategic assets onto the Korean Peninsula, reiterating what leader Kim Jong-un demanded during his New Year's Day speech last week. "Removing nuclear threats on the Korean Peninsula and fostering peaceful mood is an essential requirement for inter-Korean relations to move forward," the newspaper said in a commentary. "As clearly promised between the North and the South to walk toward the path of peace and prosperity, there should be no joint military exercises with outside forces," it added. "Bringing in war-related equipment, including strategic assets, from outside should also come to a complete end." In his New Year's speech, leader Kim demanded South Korea stop conducting joint military drills with the U.S. and bringing strategic assets from outside, saying they are a source of tensions. South and North Korean military authorities agreed in September to reduce cross-border tensions through various measures in a follow-up to a deal signed by their leaders in April to halt all hostile acts against each other. The paper noted that no matter how productive ongoing dialogue might be and how many cooperative projects are being carried out, military provocations make all those efforts get nowhere. "No sincere talks can be held, let alone better inter-Korean relations, as long as the sound of guns and cannons stay loud and danger of war lingers," it said. Meanwhile, in an editorial, the paper underlined the importance of building a powerful economy, saying that improving the livelihoods of ordinary citizens is the "most practical and pressing issue." "Only when we realize our grand objective of economic construction and resolve livelihood problems for our people will we be able to proudly declare the complete victory of our style socialism to the world," it said.